Tokyo Sky Tree tower in Japan reached its official height of 634m in March 2011. Image courtesy of Morio. Tokyo Sky Tree, opened in May 2012, is the tallest free standing structure in the world. 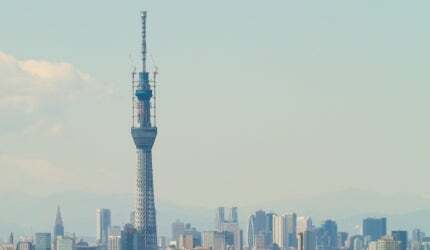 Image courtesy of Tokyo sky tree. The observation and broadcasting Sky Tree tower overlooks Tokyo streets from all directions and has public entrances on all sides. Image courtesy of KENPEI. Silhouette and cross sectional view of the Tokyo Sky Tree. Image courtesy of Namazu-tron. The Tokyo Sky Tree in Japan has a triangular pyramid shaped base. Image courtesy of Namazu-tron. The Tokyo Sky Tree, in Japan, became the tallest free-standing structure in the world when it reached its final height of 634m in March 2011. It surpassed the former record holder, Canton Tower in China, which is 600m tall. Tokyo Sky Tree is also the second tallest structure in the world, behind the Burj Khalifa (829.8m) in Dubai, UAE. The tower is located in Narihirabashi / Oshiage area, of the Sumida district in the capital city Tokyo. The high-rise tower is used as a hub for terrestrial digital TV and radio broadcasting, as well as an observation tower. It has an aquarium, theatre and cooling and heating facilities. Tokyo Sky Tree was designed by the Japanese architectural firm Nikken Sekkei. The architect also designed the 333m Tokyo Tower in 1958. The development was carried out by Tobu Tower Sky Tree and Tobu Railway at a cost of ¥65bn ($806m). Construction of the tower was started in July 2008. In November 2011, Guinness World Records recognised it to be the tallest free-standing tower in the world. It was completed in February 2012 and opened to public in May 2012. It is expected to attract about 25 million visitors a year. The Tokyo Sky Tree, under construction in Japan, became the tallest free-standing structure in the world." Plans to construct the structure were initiated in February 2005 by the Tobu Railway and six terrestrial broadcasters. The 36,900m2, triangular plane site is located near the Oshiage area and Narihira Bridge in downtown Tokyo. It is surrounded by the Arakawa River, Sumida River to the south and trunk roads and Tobu Railway lines along the east-west directions. The tower sits in the centre of the site and its three entrances overlook the streets from all the directions. The tower surroundings are being developed into an urban regeneration project spanning 400m from east to west. The town connects the Narihirabashi and Oshiage stations, Shinsui Park and the Kitajukken River with the tower lobby through public plazas. It includes parks, entertainment and shopping facilities and restaurants. About 100 architects, planners and engineers were involved in the Tokyo Sky Tree design. The Tokyo Sky Tree is based on the traditional Japanese architecture principles – convex (Mukuri) and concave (Sori) curves. The tower has a triangular pyramid shape base. The triangular footprint turns into a cylindrical shape along the height. The gradual concave curvature of the ridge line of the triangle is called warp. Transition of this section to circular form through convex upward curvature is called camber. The 8,970m² Gyre building opened in Tokyo, Omotesando-Harajuku area on 2 November 2007 (building started in June 2006). The building, which is situated on the corner of Omotesando and Kyu Shibuya River Promenade (known as Cat Street) a well-known area for designer shops, is a multi-purpose retail complex including big name shops and designers such as Chanel, Bulgari, MoMA Design Store (first outside the US) and Maison Martin Margiela. Camber structure is commonly used in columns of Heian and Nara era temples architecture. The curves also reflect the blade of a samurai sword and other traditional Japanese architectural shapes. The silhouette of the tower differs when it is seen from different angles. The observatories have a round shape to offer panoramic views of the river and the city. The first observatory is located at 350m above the ground. It accommodates a restaurant, café and shops. The second observation deck and air corridor are at a height of 450m. The structure represents state-of-the-art Japanese engineering. The tower rises on three legs from an equilateral triangular footprint of side 68m. Triangular shapes reduce the structural steel required for construction. Lines from three apexes of the triangles converge about 50m above grade along the 600m height. The length to width ratio is about 9:1. Large piles of the Sky Tree tower are built in the shape of nodular-walls and integrated into the ground to give more frictional resistance. The walled piles are interconnected radially. Steel tubes at the base measure 2.3m of diameter and have 10cm of thickness. The main structure of the tower is made of steel tube frames. The key elements have been built with double standard strength steel channels. Truss elements – tripod truss, lateral joint truss and ring truss – are used for the entire structure. The marine construction technique is a combination of triangles with diagonal, lateral and principal elements interlinked through branch joints. "Tokyo Sky Tree was designed by the Japanese architectural firm Nikken Sekkei." Highest grade of structural safety is achieved using centre column vibration control (Shimbashira-Seishin) technique of the five-storey pagoda in Japan. The central core column is a reinforced concrete cylindrical shell with staircase. It is isolated from the peripheral steel framing. It acts as a sway motion control mechanism and reduce the wind forces, other effects and seismic forces by about 40%. The tower is painted in white with a tint of blue based on the traditional Japanese colour, aijiro, thus giving it a name Sky Tree White. The tower can be alternatively lit in LED lights of purple and blue. The general contractor for the project is Obayashi Corporation. Sirus Lighting Office president Hirohito Totsune is the lighting designer.